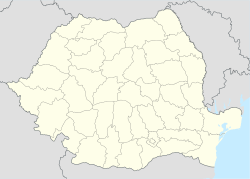 Mediaș (Romanian pronunciation: [ˈmedi.aʃ] ( listen); Hungarian: Medgyes; Transylvanian Saxon: Medwesch; German: Mediasch) is the second largest city in Sibiu County, Transylvania, Romania. The name of the city comes from the Hungarian word meggy (sour cherry). The Romanian name originates in the German version, which comes from the Hungarian name (Medgyes). According to the tradition, the town was founded in 1146, being so one of the oldest cities in Transylvania. 1200: here would have lived around 100 inhabitants. 1267: the first document that mentions the city (as Mediesy) is dated 3 June 1267. 1283: another reference appears in a document: Mediaș is listed as "villa Medgyes". 1318: the Hungarian king Charles Robert of Anjou offers the complete rights for the Sibiu region to the people living in Mediaș, Șeica and Biertan. 1359: Mediaș is called for the first time a city ("civitas"). The first seal of Mediaș was used in 1448. 1414: The St. Margaret church was the first church built in Mediaș. The first document that notes the presence of a hospital in the city is dated 1487. 1448: during his preparations for the campaign against the Turks, John Hunyadi passed through Mediaș. 1490-1534: The city is fortified by the people living in Mediaș and Șeica, after a document signed in 1477 by the king Matthias Corvinus's office. 1517: it gets the right to organise annual fairs. 1557: The population of Mediaș was hit by leprosy. The plague has also devastated the population of Mediaș several times in history, in 1586, 1601–1604, 1633, 1646, 1653, 1656–1658, 1660–1661 and 1717-1718. 1562: 34 guilds are registered. 1586: the first mentioning of a school in Mediaș ("Schola civitatis"). 1611: it is plundered by the soldiers of Gabriel Báthory. 1771-1781: the Johann Sifft typography started its activity. 1822: the first gymnastics association in present-day Romania was established. 1826: the first Romanian church in Mediaș was raised, with great effort and dedication from the Greek-Catholic Bishop Ioan Bob. In the same period, Ioan Bob established the first Romanian school in the city. 1863: public lighting of streets in Mediaș was established. 1871: the agricultural school was founded and the G. A. Reisenberger typography started its activity. 1872: the first train station was built. The current train station was built between 1963 and 1965. 1920: the city became part of Romania according to the Treaty of Trianon. Mediaș is the second industrial center after Sibiu in the county. From the 14th to 19th centuries, various manufacturers and professionals were members of associations based on their trades called bresle (guilds), the first two unions were the ones formed by tailors and cloth makers, in 1457. In 1698, Mediaș already had 33 unions. In the 19th century, unions started to merge and build factories. The first factory, called "Karres", was established in 1881 and produced various leather products. In 1888, a factory that manufactured cloth and various textiles was built, followed in 1985 by a factory called "Salconserv" that produced salami and cans. The company used to produce the famous brand of salami called Salam de Sibiu, for the company "Theil & Co. A.G. Salami und Selchwarenfabrik", located in Sibiu. In 1921, Mediaș started to manufacture windows. The factory is now called Geromed and extended its products with blackboards, mirrors, windscreens and stained glass. In the same year, a factory now called Emailul started to produce enameled pots, mugs and dishes. The "Vitrometan" factory was built in 1922 and produces various glass products, including porcelain, light bulbs and mirrors. "Relee S.A" manufactures automobile components, switches, wall sockets, relays and electric motors. Mediaș is known best for its role in production of methane gas. The area where Mediaș is located is the site of the largest natural gas field in Romania. The headquarters of Romgaz - the national gas exploitation enterprise - and of Transgaz - the natural gas carrier - are in Mediaș. Mediaș has one of the best preserved historical centers in Romania and also some well preserved medieval fortifications. One symbol of the town is the Tower of the Buglers, which is about 70 meters tall. Its construction started in the 13th century. In the 15th century it was raised to 5 tiers. The St. Margaret Church was finished at about the same time. Later, 3 more tiers were added in only two months. The roof consists of colored vitrified tiles, and four turrets were built. The tower had a guard, who would sound his bugle whenever an enemy approached. The tower has in its South-Western corner (between the clocks) a small wooden man who rings a bell, thus announcing in advance when the clock will ring on the hour. The heavy pressure of the tower on the sandy soil is the reason why the tower is slightly tilted to the North. Between 1927 and 1930, and later in 1972, the tower was consolidated. The tilt of the tip compared with the base is 2.32 m.
The city lies in the middle of the area which was inhabited by Transylvanian Saxons and in an area of 20 km around it there are dozens of fortified churches, two of them UNESCO World heritage sites. St. Margaret's Church: The fortified church was built in gothic style in 1488, with time it went through different modifications. The feeble ground structure made its tower, built in 1460, incline. 1550 the church was raised with three storeys and in 1551 four smaller towers were added to show that the city had a court. It was at that time that it gained its 68.5 meters height. In 1783 the roof-structure was changed and the small towers renovated, it was also then that the golden globe, dating from 1550, was brought down from the tower and according to tradition its content was read aloud. The tower proved to be a good spotting post. In those times the trumpeter in the tower had a great function, alerting about the approaching danger. If he made a mistake, he would've been thrown out from the top of the tower. From this does the towers name derive, Trumpeters tower. In this tower was ordered to be locked Vlad Țepeș, a.k.a. Dracula, by King Matyas in 1476. On the inside walls of the church you can see 14th- or 15th-century frescoes. The altar was made in 1480 in gothic style, and portrays the sufferings of Jesus. On the portrait, below the crucified Jesus' arm, a Wien panorama can be observed, this indicates the portray origin. The church walls are also decorated with eastern wall carpets given to the church by Christians, some date back to the 16th century. In the church there is the oldest brazen baptistry of the country made at the beginning of the 19th century.The canopy of the pulpit was made in 1679 by master Sigismund Moess. Its pipe-organ, from 1755, is appropriate for symphony concerts. While these concerts last the church benches are turned to face the pipe-organ. The grapes and wine leaves visible in the city's coat of arms refer to the (once well-known) wine from Mediaș. For example, the wine is mentioned early in Bram Stoker's novel Dracula: "The wine was Golden Mediasch, which produces a queer sting on the tongue, which is, however, not disagreeable" (Jonathan Harker's diary, May 5, on his way to the castle of the count). Football: Gaz Metan Mediaș - playing in the Liga I. Basketball: Gaz Metan Mediaș - playing in the Division A.
Cycling: The annual mountain bike marathon (in Romanian: Maratonul Medieval Mediaș) is a popular bicycle race usually held in June. ^ "ASOCIATII, CLUBURI, SOCIETI SPORTIVE SAU CULTURAL SPORTIVE" (PDF) (in Romanian). Retrieved March 9, 2014. ^ "Liceul Teoretic Stephan Ludwig Roth". ^ "Scoala Nationala de Gaz Medias". ^ "Liceul Teoretic "Axente Sever" - O școală prietenoasă deschisă tuturor!". ^ "Domeniu dezactivat!". Archived from the original on 2008-09-13. ^ "NovaTv Mediaș - Stiri locale, stiri medias, stiri sibiu, ultima ora › novatv.ro". novatv.ro. ^ "Biciclete, vin și istorie – toate la Mediaș - Veni, vidi, velo !". Veni, vidi, velo !. Wikimedia Commons has media related to Mediaș. Wikivoyage has a travel guide for Mediaș.